Editor's note: Arsalan Iftikhar is an international human rights lawyer, founder of TheMuslimGuy.com and author of the book "Islamic Pacifism: Global Muslims in the Post-Osama Era." (CNN)–Imagine that you woke up on a beautiful Sunday morning to hear the news of a brown, bearded, gun-wielding madman who stormed into a Wisconsin church full of blond-haired parishioners and killed six innocent people. One of the congregation's members told a local news station, "Nobody's angry here. We're just confused. Was this a random act? Was this directed at us because of the way we look?" Sadly, it's probably going to be the latter. Oak Creek, Wisconsin, Police Chief John Edwards said at a news conference that the case is being treated as domestic terrorism, and the FBI is taking over. But it's important for our greater American society to also condemn acts of terrorism when the perpetrator happens to be a white guy. Since authorities say the gunman was a white dude named Jared Lee Loughner, he was just a kooky loner whose mental health must have been the triggering factor. But if his name were Ali Akbar Nahasapeemapetilon, nobody in America would care a bit about his mental health issues. Since observant Sikh men keep a turban (known as dastaar or pagri) and unshorn hair, which often manifests itself into a long beard, many Americans after September 11 wrongfully conflated Sikh Americans with Muslim Americans because of this "turban-and-beard" look. To highlight the sheer tragic irony and stupid human ignorance of bias-motivated hate crimes within America, the first actual tragic victim of a post-9/11 "hate crime" murder in the United States was neither a Muslim nor an Arab. Four days after 9/11, Balbir Singh Sodhi, a 49-year-old Indian Sikh-American businessman, was brutally shot several times and killed instantly by Frank Roque in a Mesa, Arizona, gas station. According to BBC World News, the county attorney stated that Sodhi was killed for no other apparent reason than that he was dark-skinned and wore a turban. Just like America has been on high alert for brown-skinned terrorism since September 11, millions of Americans of Arab, Muslim, Sikh and South Asian descent have equally been on high alert about reprisal attacks against brown-skinned Americans that happened immediately after September 11. On the same day as the Sodhi murder, September 15, 2001, Adel Karas, a 48-year-old Egyptian Orthodox Coptic Christian and father of three, was viciously murdered outside his suburban Los Angeles import shop. In Texas, both the FBI and local police investigated the murder of Waqar Hasan, a Pakistani store owner who was found shot to death outside his grocery store in suburban Dallas. One day after 9/11, in the early morning hours of September 12, at least six bullets shattered several windows of the Islamic Center of Irving in suburban Dallas. Similarly, on September 12, 2001, 29-year-old Eric Richley of Middleburg Heights, Ohio, decided to drive his white Ford Mustang into the front glass doors of the Grand Mosque at the Islamic Center of Greater Cleveland. Places of worship including Muslim mosques, Hindu temples and Sikh gurdwaras became instant targets for patriotic terrorists seeking to lash out at innocent Americans like the Sikh victims of the terrorist attack in Wisconsin. Sikhism emerged out of a culture steeped in both Hinduism and Islam, and early Sikhs attempted to reconcile the two, in part by focusing on heartfelt devotion to God rather than rites and doctrines. "There is no Hindu and no Muslim, so whose path shall I follow?" asked (Sikh founder) Guru Nanak. "I shall follow the path of God." Like Muslims, Sikhs are strict monotheists who emphasize divine sovereignty. They reject the view that God incarnates in human form, believing instead in a formless God that can be known through singing and meditation. According to professor Gurinder Singh Mann, the "Sikhs lay emphasis on a life of hard work, social commitment, and ethical living. A complex set of doctrinal, historical and sociological reasons made them a very political people and they have kept up that heritage in both the Punjab, the land of their origin, and wherever they have migrated to in the past century." Most Americans do not know that the first Sikh American member of Congress was Dalip Singh Saund, who represented California's 29th congressional district in 1957. Since Sikhs have served America as doctors, lawyers and teachers for more than a century, any attack on their house of worship should be considered an attack on all houses of worship. 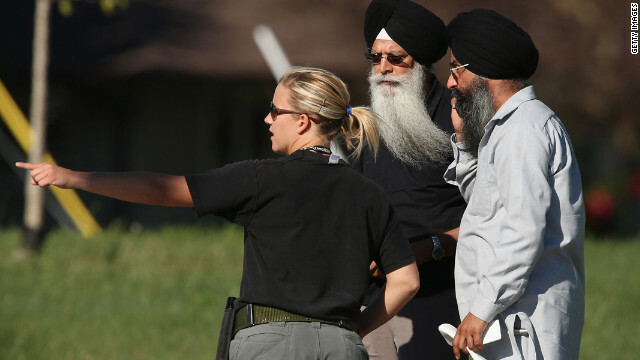 So, if the mass murder at the Sikh temple is not referred to as an act of "terrorism" by virtually every member of our American media and sociopolitical elite, the only message that this will send to millions of people of color across America is that the term "terrorism" has been co-opted and shall apply only when brown bearded men are the shooters, not when they are the tragic victims. Good answers in return of this matter with genuine arguments and describing everything regarding that. Thank you for any other informative website. Where else may just I am getting that type of info written in such an ideal manner? I have a venture that I'm just now running on, and I have been on the look out for such information. I personally belive that no one deserves to die through violence, and I personaly detest racism. This was murder with the purpose of 'cleansing' america. I don't know about the rest of you but I think that sounds alot like genocide. Next people will be forming death camps for all non-christian, non-white people. Заказывая Отливы для окон. Вы можете отдать предпочтенье цвет отлива по каталогу otliv-sm.ru/otliv.html Мы не только изготовим Ваш заказ, но при необходимости, доставим его на нашем автотранспорте. Я думаю, что комментарии неуместны. Я прошу прощения за мой плохой русский. okay enough with the moooslims. So FEDS what's up with the realese of the MOB"S hit man from new york sure would like to meet him and have a talk and test out my healing ability another one of my gifts. In the wake of the recent shootings, we need to gain some perspective. Human beings act out of Instincts, primitive Survival Instincts. One of these instincts, our Warrior Instinct, serves the human hive with a very important purpose. Our Warrior Instinct guarantees that a certain percentage of human beings will act out of fear and anger and find reasons to justify killing other human beings at a regular pace. We have no natural predators: viruses, and a few large animals. But, certainly not enough to keep up with the rate at which we reproduce. We self police our numbers through warfare and random acts of violence. We do not go into hospitals a and kill off the sickest 10%. We do not kill everyone over 85. This is not survival of the fittest, this is survival of the random. When we drop a bomb on a village we kill old and young, sick and healthy, male and female. We kill a random sample of human beings. When Jared Lee Loughner tried to kill Gabrielle Giffords, he shot old and young, sick and healthy, male and female. So did James Holmes in Colorado, and Wade Michael Page in Wisconsin. James Holmes will probably not be able to vocalize exactly why he did what he did. Remember, this is Instinctive behavior, not rational or logical behavior. That is why it makes no sense. It's not sensible, it's Instinctive. And so he will be incorrectly judged by psychiatrists as have psychological problems. Holmes is not psychotic. He is not mentally ill or psychologically disturbed. And he is absolutely not a lone, random nut job . He acted with the same conviction that a soldier uses to justify pulling a trigger, or dropping a bomb. Psychiatrists will have to judge Holmes, that's normal. Psychiatry is all we have to judge this behavior. It is wrong, but it is normal. For Holmes to have killed those people is wrong, but it is also normal. Normal does not mean good, or right, it simply means normal. Psychiatry is the most popular religion right now. Which puts pressure on psychiatrists to explain behavior. Without a clear understanding of Instinctive behavior, they are only capable of explaining how this behavior might have been psychologically triggered. But, some psychiatrists are starting to talk about how some people seem to be 'Hard Wired' to do certain behaviors. The awareness of our Instinctive behavior is just beginning. In the last 400 years, we have developed the ability to manipulate the birth and death rates to our advantage. One child in eight used to survive, now one child in eight dies. Everything happens in balance. Ying and Yang. For every advancement we make in saving lives, we manifest equal amounts of evil that focus on taking lives in a random fashion. This is our Warrior Instinct rising to balance out the work of our Nurturing Instinct. We are self-correcting as a species. It is only the denial mechanisms of our Warrior and Nurturing Instincts that block us from seeing this. But, those who act primarily out of Warrior or Nurturing Instinct account for less than half of the human population. Most of us can see the truth. As nations, the two things that we spend most of our money on, is killing people and trying to keep people alive. If you look at our behavior, without the judgement, you will see our Instincts. Just look at what we ACTUALLY do. This having been said, those of us who act primarily out of Nurturing Instinct are not going to stop trying to save every baby, are we? No. We are just acting out of Nurturing Instinct, and that is normal. Just as normal as walking into a crowded theater and killing a random sample of human beings. Lost me at first paragraph..ignored the rest...might want to shorten your posts. It appears that only ignorant bigots visit CNN anymore. Reading these comments has become a monumental waste of time. How sad that there is so much ignorance in this country...but it's to be expected. You can only expect to be kicked by a mule. Um, Arabs are White guys. Sure as Hell aren't black? Don't think that the commentator knows what he is saying. White is hard to define.